Oh My God! A New Ben!!! I *heart* Ben Folds. Seriously. And he has a new album out (CD for all you youngsters.) It's called "Songs For Silverman" . Go buy it! You won't regret it. Ben Fold has an alternative pop piano style that is addictive. Okay, so Pete emailed me this morning to tell me that this album was out, so I went to Amazon and bought it. Here's the cool part -- when you do this they not only send you the CD, but also make a copy available for immeadiate download. And the copy that you get to download has commentary by Ben before each song! Yipee!!! I am way too excited!! I'm listening to it now and I am not disappointed. And the final icing on the cake. . . Embroideries by Marjane Satrapi is now available and the two together came to $25.52. That's right, free shipping baby! 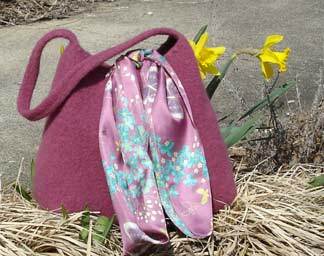 Thank you so much for the nice comments about the Elizabeth Bag! And thank you to all the yarn shops who have placed orders and all the people who have bought the pattern online. I am overwhelmed! And thank you to my secret pal! The Mt. Goat that you sent is gorgeous and I can't stop looking at it. I'm keeping it on my desk so that I can pet it and stare at it :) And the little kitty book is so cute too! The name made me giggle because we call one of our cats "fangy" because he has long canine teeth that stick out a little. No knitting to report. All my time and effort is being put into pattern assembling right now. I'm making sure to be more careful with the exacto knife though! I think I learned my lesson. Elizabeth Bag and Birch Progress! Finally! After much knitting, writing, editing, photo taking (thanks Pete! ), photo editing, printing, website updating, etc. . . I present the Elizabeth Bag! Yipee! 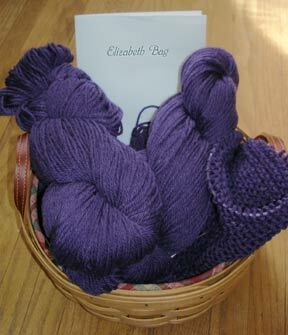 I am beginning to ship the patterns out to yarn shops this week, so please check with your LYS next week. 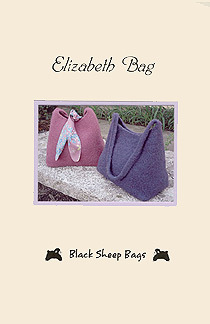 And if they don't carry Black Sheep Bags patterns, I would really appreciate it if you would tell them about me! Here is the current list of shops that sell my patterns. And here is the Black Sheep Bags Online Store, for those of you that are interested in the pattern but don't have a LYS on the list near you. I have been knitting -- really I have. See my pathetic bit of progress on Birch? Really I should say that. 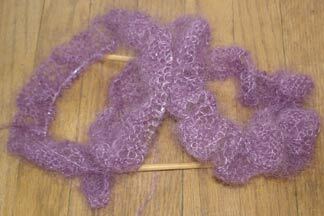 This is one of those shawls where you cast on a ridiculous amount of stitches and work your way down. So really it seems to get faster as you go. (Okay, it's all psychological, but this reasoning is working for me.) I think I've completed three pattern repeats so far. The yarn is incredible, but I do have to pay attention to those little mohair-y stitches which like to cling together at times. 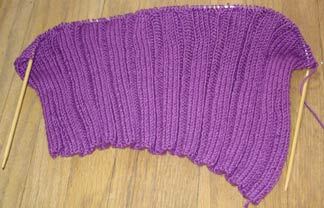 It's all purple knitting here at Booga J's place. 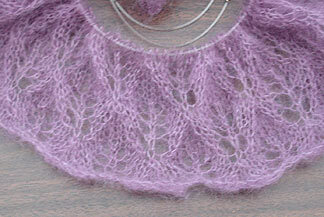 . .
First up is the beginnings of Birch in Dewberry Kidsilk Haze. I'm pretty proud of this because the first time I cast on was a disaster. After only 3 rows I had the wrong number of stitches, had to rip, ended up with a nasty knot and had to throw a good bit of this wonderful yarn in the trash. Grrrr. . . This time was much better (a few mistakes in the first two rows were "creatively" corrected) and I have made it through one pattern repeat. Hurrah! Next up, my pathetic progress on the Asymetric sweater in Cathay. It's cotton. Need I say more? Finally we have the Elizabeth Bag! This is the second sample of the new bag for Black Sheep Bags that I talked about in my last post. I also knit another Sophie this week for a new release of that pattern. 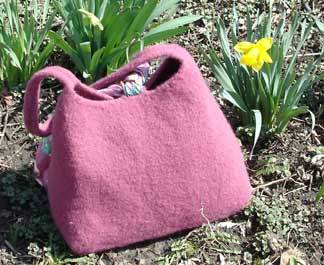 Some shop owners have requested a nice printed version of the Booga Bag and Sophie Bag. 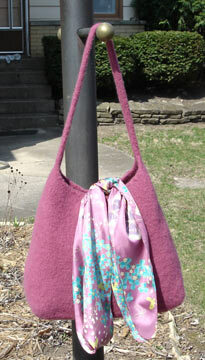 I'm including a new handle version in the Sophie pattern, so I had to knit it up for the cover photo. I've been reading too! Book reviews later. 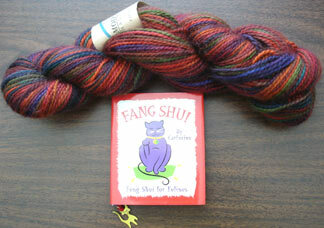 But before I go, I have to say that I got At Knit's End by the Yarn Harlot and I'm really enjoying it! I'm trying to read only a few pages each night so that it's not finished too quickly! And I finished my Lorna's Laces socks too! 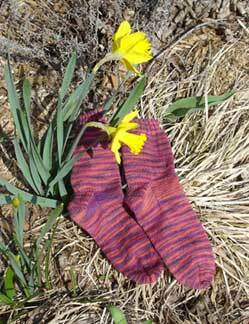 These were made with Lorna's Laces Shepherd Sock in Irving Park. They knit up fairly quickly, considering that I was knitting the on 1's. Now that they are all finished, I started on my first pair made with Opal sock yarn. Pictures soon, there isn't much to show yet. And I'm behind on my Book reviews. I have finished both Hominids by Robert J. Sawyer and Blankets by Craig Thompson. Both were excellent and I'll post reviews soon!